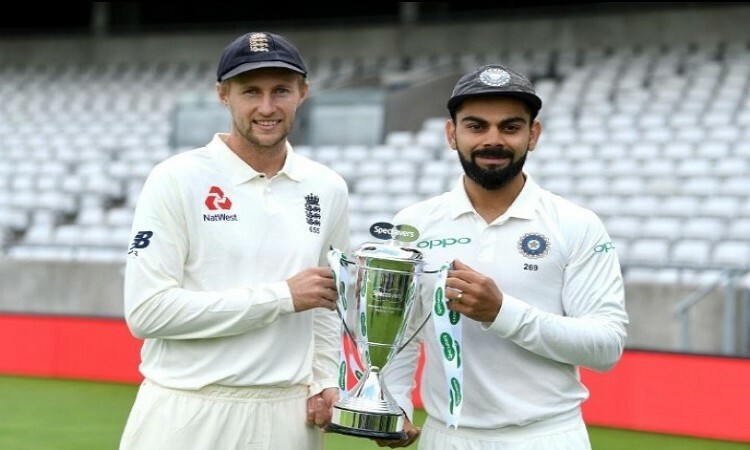 Birmingham, July 31 (CRICKETNMORE): India will aim for a bright start to the gruelling and testing five-match Test series against hosts England when the first match begins at the Edgbaston Cricket Ground here on Wednesday. India have not won a Test series in England since 2007, achieved under the captaincy of Rahul Dravid. And now under the captaincy of Virat Kohli, India are bracing up for a stern test in difficult English conditions. In this long tour of England, India won the Twenty20 International (T20I) series but they suffered a set-back in the three-match One-Day International (ODI) rubber. Following the loss in the ODIs, India will look to make a strong comeback -- but in a different format which challenges every cricketer to the hilt. However, India must take heart from the way they fought against South Africa away even though they lost the series 1-2. India were impressive in all of the three Tests but in the first two Tests, they let the hosts off the hook. In the third Test, India pulled off a brilliant win which should give the side confidence and belief that no matter what the conditions are, the team is capable enough to at least be competitive. The biggest positive from the South Africa tour was the fact that the bowlers managed to pick 10 South African wickets in each of the six innings. Moreover, many experts have tipped the current pace bowling unit as India's best in years and they will also look to make the best use of the seam-friendly wickets. While Bhuvenshwar Kumar and Jasprit Bumrah will be out of action for the first three Tests, Kohli will leave out one of Mohammed Shami, Ishant Sharma, Umesh Yadav and Shardul Thakur in his fast bowling attack, which will be further boosted by all-rounder Hardik Pandya. Considering it is a long five-match series, India need to be wary of the physical toll on the pacers and Kohli will have to utilise them smartly. The pacers will need to fire collectively and be ready at every opportunity because rotation will be a key factor. India may field one spinner and that could be a big decision to make. The experienced Ravichandran Ashwin and Ravindra Jadeja have shouldered the responsibility to lead the spin attack for a long time but the inclusion of chinaman Kuldeep Yadav has made the issue interesting as the skipper is likely to go with any one of them. Jadeja is expected to be the least-expected to be picked. What could favour Ashwin is his experience and his handy batting skills. Kuldeep impressed everyone in the recently-concluded limited overs game against the hosts but playing a five-day game will be a completely different scenario and the skipper might be tempted to include him in the playing XI. Meanwhile, the keeping gloves is likely to be handed to Dinesh Karthik ahead of young Rishabh Pant as the former carries more experience than the Delhi stumper. India also have a couple of crucial calls to make in the batting department. The form and performance of top-order batsmen Shikhar Dhawan and Cheteshwar Pujara has been a worry, even as voices have been growing for Lokesh Rahul's selection to open the batting with Murali Vijay. Dhawan struggled in the T2OI series before making scores of 40, 36, 44 in the ODIs. While he made a pair of ducks in the warm-up game against Essex ahead of the Tests to help his critics, Rahul made 58 in the middle order and 36 not out when given the chance to open in the second innings. Pujara posted scores of 1 and 23 against Essex. Vijay, Kohli and vice-captain Ajinkya Rahane are proven performers in the overseas conditions and India will rely on them to put big scores. To counter them, England will depend on their pace bowlers who will look to exploit the home conditions to the fullest. James Anderson (540 wickets in 138 Tests) and Stuart Broad (417 wickets in 118 Tests) have huge experience and they will be supported by youngster Sam Curran and all-rounder Ben Stokes in the first Test, captain Joe Root confirmed his line-up on Tuesday. There has been a lot of controversy around leg-spinner Adil Rashid's comeback into Test after quitting the longest format two years ago. He has been picked for the first Test after an impressive ODI series outing. Stokes will give the balance to the English team with his batting and bowling and will be eager to prove his value in the series. He, along with, Alastair Cook, Root, Jos Buttler and Jonny Bairstow will have the bulk of responsibility of scoring runs. For the first Test which will be England's 1000th, the hosts have picked two young batsmen in Keaton Jennings and Dawid Malan -- both will be desperate to justify their captain's faith in them.